The Ken Kesey Collection is housed in the Special Collections & University Archives at the UO Libraries. Today (Jan. 16), OPB will host a free, public pre-screening of its new Oregon Experience special “Ken Kesey,” at 7 p.m. at the McDonald Theatre in Eugene. This new documentary presents rare interviews with Kesey family members, including his son Zane, daughter Sunshine, granddaughter Kate Smith, widow Faye Kesey McMurtry and his 97-year-old mother Geneva Jolley; and Ken Babbs, a Kesey friend, writer and lifelong Merry Prankster. 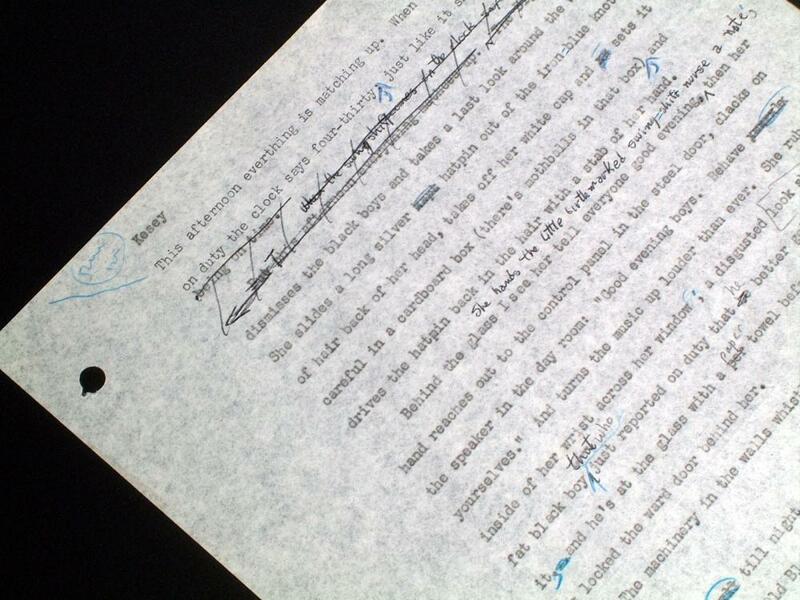 UO Knight Library Special Collection’s Ken Kesey Papers also provided extensive background material for the documentary. While working on the documentary, writer and director Eric Cain visited the Ken Kesey Collection that include typewritten manuscripts, artwork, collages, photographs, and handwritten letters, notes and correspondence from 1960 through 2001. “It’s fundamental to our work to collect primary sources, and the Kesey Collection is just one of many examples of collections that we have in our repository,” said Linda Long, manuscripts librarian at the UO Libraries. The screening hosted by OPB at McDonald Theater will include a viewing of the documentary and a Q-and-A session with Cain. The event is free, but for guaranteed seating, RSVP at http://www.mcdonaldtheatre.com/forms/free_tickets.html. A second pre-screening will be held at the McMenamins Mission Theater in Portland on Friday, Jan. 17. The Oregon Experience special “Ken Kesey” will air on Monday, Jan. 20, at 9 p.m. on OPB TV. For more information, please visit http://www.opb.org/programs/oregonexperience.